So this was in front of me at 2.36... I did look around for something more interesting... but then this blue bottle of Coconut oil is just so super interesting too. 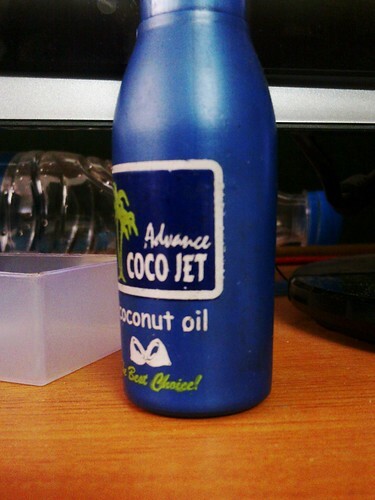 Every Indian recognizes the blue bottle, if not the brand. The original brand I was familiar with was 'Parachute coconut oil', dutifully massaged into our young scalps by aunts/mothers till we began scorning the process. It perhaps accounts for plenty of the thick, long, black hair in India. The Staple of Indian Hair, a photo by amulya on Flickr.